My son loves his name and he loves to write it in a variety of places and ways. As part of my Back to School Basics series we are reviewing spelling and writing his name. 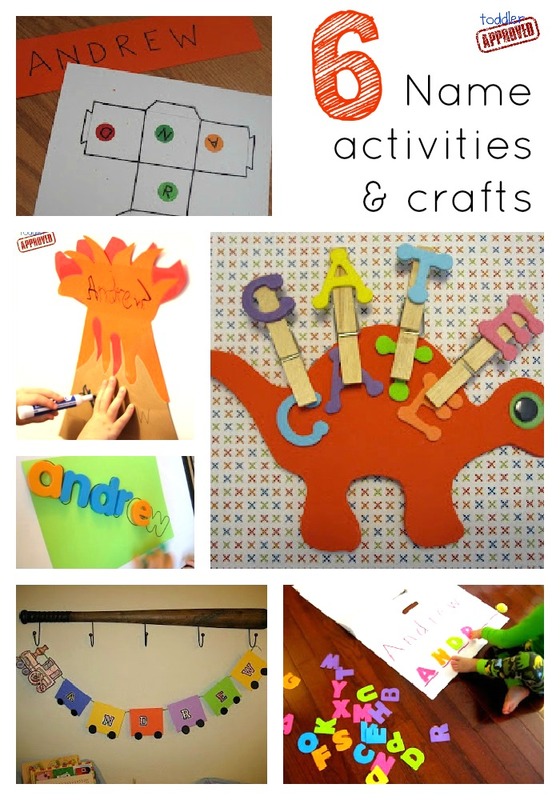 On my Name Activities and Crafts Pinterest board I have shared a lot of posts that teach name writing and spelling in simple and fun ways. 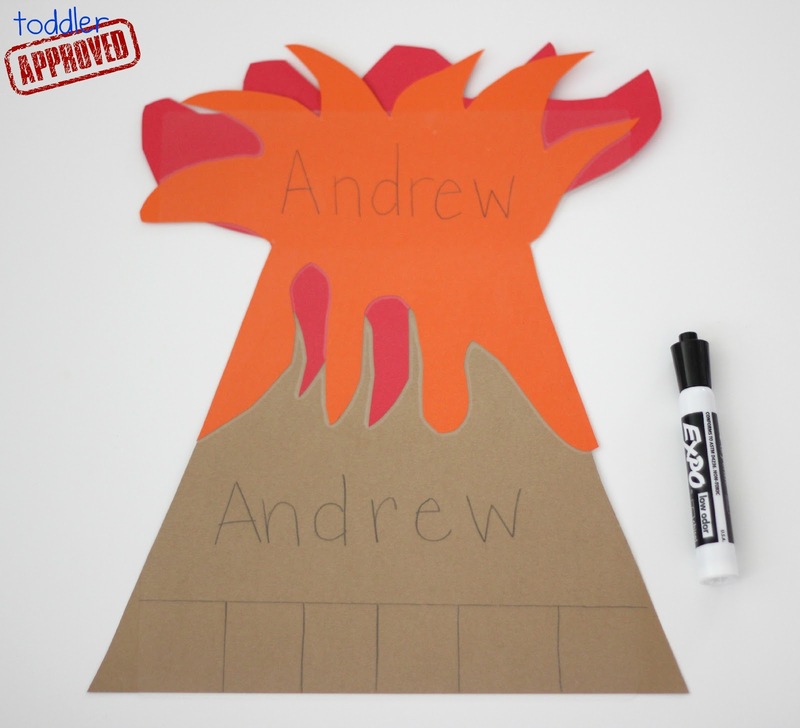 This week we created a silly exploding name poster based on my son's love for volcanos. He was extra excited to write his name again and again because he got to write on an erupting volcano! I'm going to share with you the basics of how we created our poster... but then I would encourage you to make your own based on your child's interests or current obsession- Spiderman, dogs, cats, basketballs, etc. Create an object that your child loves using cardstock or a large poster board. Laminate the poster using contact paper or a laminator. Hang the poster somewhere in your house along with a whiteboard marker. I liked putting ours on our easel because the slant of the easel made writing easier for my son. Encourage your child to practice tracing and writing his/her name. You can model first and then just let your child explore. I don't spend very much time correcting my son when he is writing... I just model the correct way and keep the activity fun and relaxed. *You may have noticed that one of my writing areas is filled with little boxes. My son does really well with writing smaller when he has a visual boundary, so the boxes work well for him. You could also just draw a large rectangle or just leave space open for your child to fill as they please! What do you think your child would have fun writing their name on? What are your toddlers or preschoolers interested in right now? 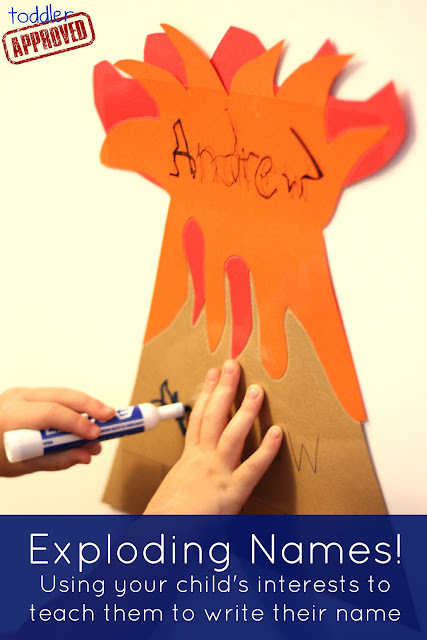 What other fun ways have you used to teach your child about their name? Have you missed any of our other Back to School Basics posts? Just click on the links below. I love the way you personalized name writing practice! After all what could be more personal than your own name! Great idea! The link for the train takes you to the dinosaur. It's pretty straight forward and I think we can all figure the train out, but thought I'd let you know! Have a great day.